The Big One joined the local swim team last week and we went along for her first practice on Thursday. It’s really just like a swimming lesson with a few other children, for an hour twice a week. It was the first lesson that she’d had in a 25 metre pool and she did really well. Yesterday was supposed to be the second lesson and I’d decided to swim with the Little One at the same time so we could copy the lesson, as she needs to be 4 to join. However, when we got to the pool it was decked out in bunting (red, white and blue so it made us feel very at home having seen so much of it in the Queen’s diamond jubilee celebrations the last few days!) and there were far more than the usual 3 class members in the 4-6 age group. Hmm. It looked very much like a swimming competition but I didn’t say anything to the girls as the Big One is not always keen on being involved in things like this. We found Coach Amanda and she was delighted to see us as the other swim team had 4 times as many team members! 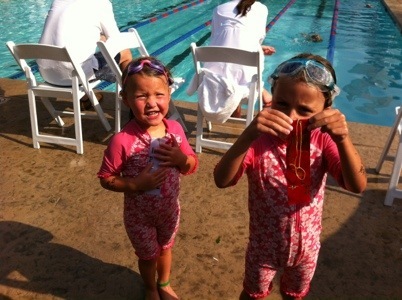 The Little One instantly became a member of the Royal Oaks swim team, despite being officially too young, and both girls were signed up for a few races in the 6 and Under age group. The Big One was in the first race – 25m freestyle. She was delighted to come fourth and get a ribbon. She would have come second if she’d realised that she had to dive in when the hooter went but once I’d explained this to her she was determined to get a different colour ribbon in the next race. The backstroke races were next and the girls were in separate heats. My Lovely Husband had rushed from work when I told him that the girls were taking part in their first swimming races and arrived just in time to see the Big One come in second – hurrah! The Little One took part in the second backstroke race and came in third, which she was delighted with and meant she got a different colour ribbon to the ones the Big One had. The final races were breaststroke (or froggy arms as we prefer to call it!) The Big One was in the first race and came in second place again. The Little One was in a race with one other child (who was 6) and had never swum 25 metres of breaststroke before but made it all the way to the end and was delighted to get a second place ribbon and a huge cheer from the spectators! They are both determined to win first place ribbons next time and I’m sure they will. The Little One is very pleased that she can go along to swimming lessons with the Big One twice a week as part of swim team. We’re very proud of our little mermaids.